Hey hey! 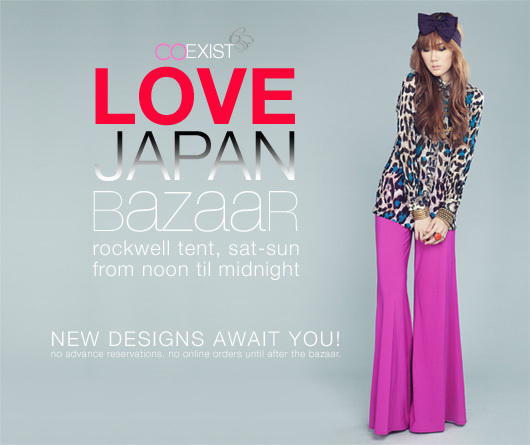 Coexist will be selling NEW designs at the Love Japan Bazaar this Saturday and Sunday at Rockwell Tent, from noon til midnight. It’s the usual drill: no advance reservations during this time and no online orders until AFTER the bazaar. Also, selected items from our previous collections will be on sale for up to 50% off!!! If Coexist is not enough for you to go, how about helping people in need? Love Japan Bazaar is a fundraising bazaar for the benefit of Japan’s rehabilitation following the earthquake that shook the world earlier this year. 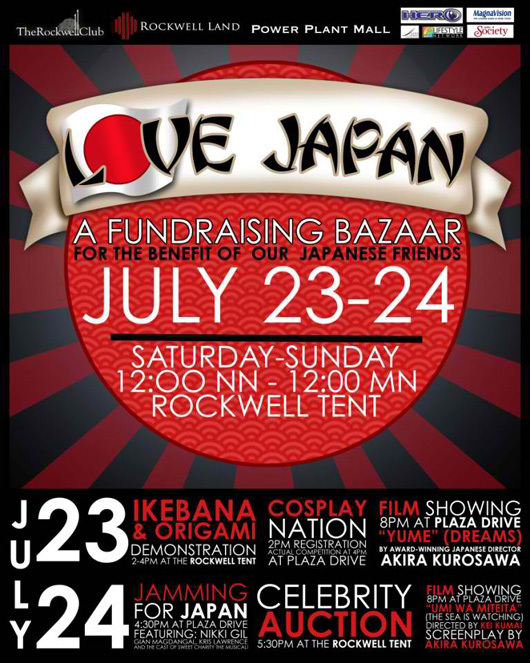 The Rockwell community have partnered up with the Japanese Embassy for this one-of-a-kind bazaar/celebrity auction/garage sale/food market event. All proceeds will be donated to Japan through the Japanese Embassy. Sell or Donate.Â If your closet or home is overflowing with furniture, appliances, gadgets, toys and clothes that you don’t need, you can sell them to help Japan!Â Food booths are also available. Â For those who don’t have enough items for a booth, donate an item or two through the Rockwell Club and Rockwell will sell that for you and consider it your donation! Shop, Dine and Enjoy.Â The shopping possibilities are endless in this special weekend souk, composed of unique bazaar items from Rockwell tenants and collections from select brands from Power Plant Mall selling at discounted prices!Â There’s fun for everyone as Rockwell adds to the festivities with Japanese-themed activities like a CosPlay Competition and Anime Festival on July 23 and a Jamming for Japan mini concert on July 24. I hope to see you all there! Not just for Coexist, but more importantly to show our LOVE for Japan! P.S. Free popcorn and mojitos will also be given out from 8-10pm. So for all those mukhang freebie like me, goooooooowwww!